It is with great pleasure that we would like to inform you that the architectural design of the SPCleantech member, Horizone Studio, Textorial Park II in Łódź was placed under the BREEAM Christmas 2018 campaign by BRE Global among the 10 most interesting projects in the world that underwent the BREEAM environmental certification in 2018. SPCleantech within the framework of the platforms: „Intelligent Buildings / BMS / Ecological Building Materials” and „Smart City / Sustainable Urban Development / e-mobility” promotes responsible management of urban space through meetings, workshops, seminars, conferences, economic missions, and the latest technologies used in green sustainable construction. SPCleantech organized, among others last year’s conference „Green construction – fashion or necessity? Is it worth to certify buildings? „The next conference on this subject will take place in January 2019 in Rzeszów, and then in other Polish cities. Textorial Park II project in Łódź, to be erected at ul. 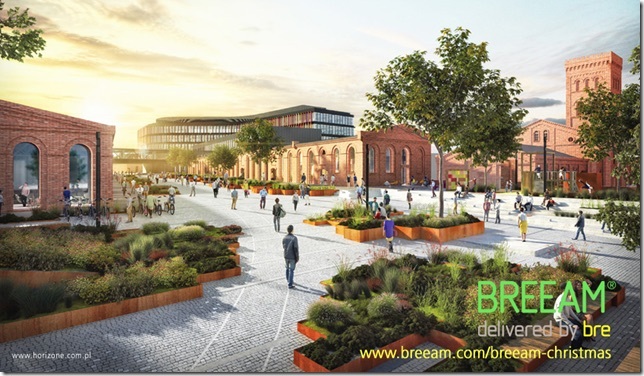 Tymienieckiego, was chosen by the British organization BRE as one of the most interesting investments promoted under BREEAM Christmas 2018. 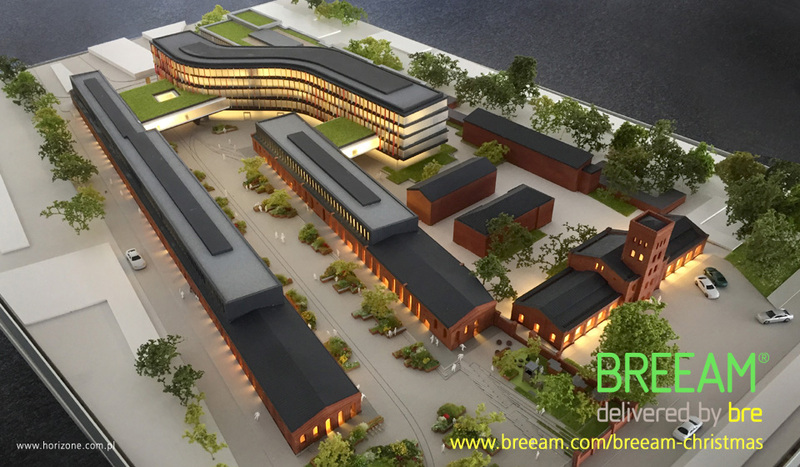 As part of the annual BRE campaign, it distinguishes the most interesting projects in the world that have received the BREEAM certificate in a given year and set new standards in the field of human-friendly construction and the environment . Textorial Park II is a complex of three buildings with an office and service function and a total leasable area of ​​approx. 26 thousand. sq m, which will be erected at the famous Księży Młyn in Łódź. The investment is related to the revitalization of two historic buildings of former cotton warehouses adapted for commercial and service functions, supplemented with a modern office building. Historical tissue, entered into the register of monuments, was not only a design challenge, but also a difficulty in achieving such a high level of ecological certification (when receiving the Textorial Park II certificate it was the highest rated office complex in Poland at BREEAM NC 2016). The revitalization of over 2 hectares of land connected with the planned investment will be an interesting offer not only for employees of new buildings, but also for the residents of the vicinity of Księży Młyn. On the ground floor of the designed objects there will be mainly commercial and service premises, even a branch of the municipal library is planned, while around the buildings an attractive, multi-functional urban space with small architecture has been designed, encouraging residents to spend time together. The comprehensive design also takes into account the idea of ​​sustainable transport, the creation of, among others, Textorial Park II bicycle service station, and in the car park there will be sockets for charging electric cars and preferential parking spaces for those who enjoy car-sharing. The investor is St. Paul’s Developments Polska – a British developer focusing its activities on demanding brownfield revitalization projects. The architectural office of Horizone Studio from Krakow is responsible for the project. The unit conducting the certification was Sweco Consulting. The investment is an interesting example of the growing trend in the development market in Poland of revitalizing old industrial plants and giving them new functions. In this case, the modernized objects will be accompanied by remarkable new architecture. The construction is planned to start in 2019.